Even with enterprise grade wireless becoming more common even in small business environment, wired networking is still king. It’s easy to get started rolling your own network cables and terminating your own wall sockets and patch panels for not much money – here’s my quick guide on building a Network Cabling Toolkit for Less than £60. While cheaper options are always available, i’ve done my best to pick products that offer the best value for money in the long term. In addition to these you are going to need a set of screwdrivers and a set of side cutters – but i’ll assume you already have those as part of your general IT toolkit. The punchdown tool is the star of the show in any networking toolkit. The design of the blade allows you to lock, punch and trim the individual wires in a single motion. Without one of these tools you simply wouldn’t be able to terminate patch panels and wall sockets unless you are using proprietary equipment. Punchdown tools also include integrated hooks that allow you to neatly unpick mis-terminated wires should the need arise. While picking up a cyclops isn’t strictly necessary it will save you a massive amount of time in the long run and ensure that your installs are neat and tidy. Depending on the depth of cut required, you either spin clockwise or anticlockwise one the cable has been inserted at the desired length. Multiple spins may be required depending on the thickness of the outer casing, but this tool allows you the fine control over its application. This cutting action neatly exposing the wires ready for punchdown. You can get similar results using a blade but it’ll take far longer and won’t be as safe. If you are planning on fully populating a patch panel then this will pay for itself rapidly in time saved alone. A good quality crimping tool is also an essential in networking toolkit. The crimping tool allows you to crimp a standard RJ45 jack onto the end of a length of ethernet cable. This is ideal for when you need to make very specific lengths of patch leads, or when you don’t have any pre-made ones and need to knock something together quickly. The design of the tool allows for the optimal pressure on the RJ45 jack to ensure good contact between the wires and the pads and a strong and durable connection between the jack and the cable. Most crimp tools also support RJ11 as well as RJ45, so they have a variety of uses beyond just network cables as phone cables are also supported. The last component required when building a Network Cabling Toolkit for Less than £60 is a cable tester. The function of a cable tester is to ensure that there are no continuity issues with the newly patched or terminated cable. Some simpler units show you a set of flashing lights, one for each of the wires in the ethernet cable whereas some are able to perform error checking or continuity testing, informing you of potential damage to a cable and at what distance in the cable run. The sky’s the limit regarding functionality, and so it price. While you can pick up very basic cable testers for less than a fiver on eBay, I would recommend spending a little more and going for one with wire tracing built in. If you have wire tracing then you can plug the emitter into one end of the cable to be traced or checked and use the tracker to locate the wire at the other end. This removes the need to physically trace the cable from one end to the other as you are doing it electrically. This can be an incredibly frustrating process especially if you are working on the spaghetti comms cab from hell. As with any tools, you can spend an amazing amount of money on cable installation tools but you can get a good Network Cabling Toolkit for Less than £60. This basic toolkit will allow you to get all your patching done at both the patch panel and wall socket ends and ensure that they are working fully. Note: Some of the links in this blog post are affiliate links, meaning that if you purchase one of the recommended items I get a small commission for the sale. This helps to keep the blog free to use for everybody. 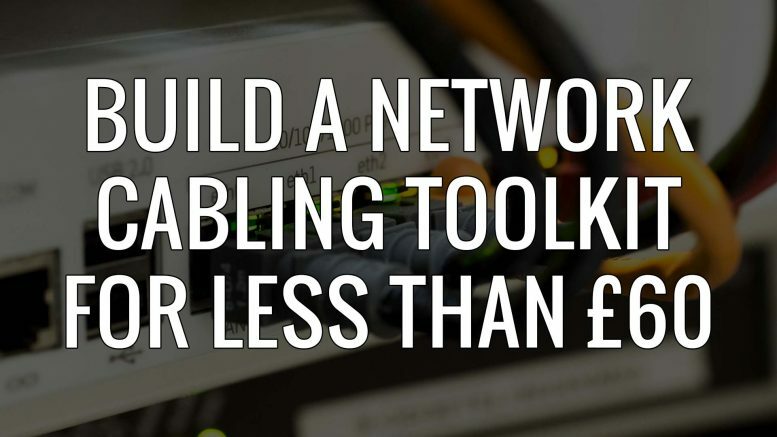 Be the first to comment on "Network Cabling Toolkit for Less than £60"